There are so many types of signs that you could choose from, so why pick a neon sign? Electrical illuminated signage acts as a powerful marketing tool to attract customers to your business, and neon signs are a perfect example. They can help you to create the perfect branding and atmosphere you want for your business. In this blog, Springfield Sign shares how neon signs can be beneficial to businesses. Neon signs are versatile and come in all sorts of shapes, sizes, and colors. The uniqueness of this type of project will really help your business stand out amongst the surrounding businesses. They are great for many industries, from restaurants to healthcare facilities. The design can reflect your businesses’ unique color scheme, logo, and style. Working with an experienced company like Springfield Sign will allow you access to a plethora of design options. Neon signs are almost impossible to miss, even if an individual is driving past them. Neon signs are also aesthetically pleasing, and many customers will be influenced by your sign design. Colorful and bright, electrical illuminated signage attracts customers and creates interest in your business. If you have a business that is open late into the night, a neon sign will continue to draw in customers long after the sun goes down. Neon signs are dependable options due to the fact that they have a long and reliable lifespan. Proper service will also ensure that your neon sign continues to glow brilliantly for years to come. Neon signs are highly effective when appropriate design processes are put into place. Putting your trust in Springfield Sign to design, build, and install a neon sign will help your place of business stand out. Springfield Sign has a history of providing outstanding neon sign designs, whether it is 20 feet or 2000 feet of neon glass. When you invest in a neon sign, you are investing in your business and your brand. 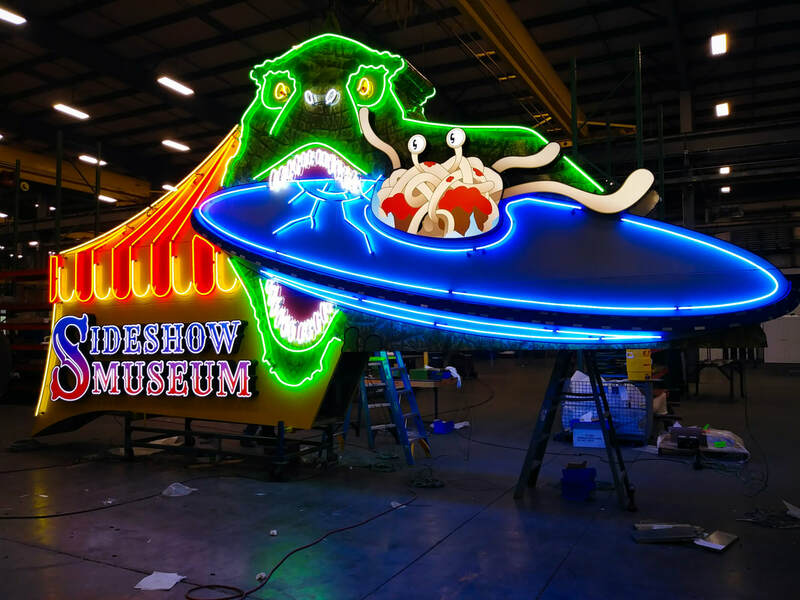 If you are set on neon, the expert team at Springfield Sign has the experience to create the perfect electrical illuminated sign for your business. Whether your project is large or small, Springfield Sign is here to help! Contact us today for more information, and download our Products and Services Guide to evaluate our many signage options.